With the UK solar market winding down under 1.2 ROCs, most of the activity is centred on getting as many of the existing projects done under the respective FiT, ROC, NIROC and CfDs schemes that have supported the growth of the ground-mount sector in the UK since 2011. With attention turning quickly to the Republic of Ireland, and the project count for solar farms now hitting the 500 site level, it is interesting to review which companies have had the most success in developing solar farms in the UK. Finally, understanding how sites have changed ownership pre-build for each of the project developers also allows us to speculate on how solar deployment in the Republic of Ireland may be different to that in the UK. Furthermore, for pure-play EPCs or component suppliers (modules, inverters, mounting), this in part answers the question: who should I talk to about winning new business today in Ireland? It is not uncommon to read about lists of project developers for UK solar that are wildly inaccurate, and miss the whole point about what a project developer is. All too often, people erroneously assume that if a well-known solar company announces they interconnected a solar farm, then by default they developed it. Not so. Our ranking of project developers is based upon sites that have been energised, or accredited, with the overall ranking done by cumulative megawatts finally connected, the full details of which are all included in our UK Solar Ground Mount Report 4: Completed Assets report. The definition of a project developer is very simple: this is the company that put in the planning application, signed the cheque to the local planning authority and submitted all the necessary documents in order to have a valid application lodged. There is really no ambiguity surrounding this. Every large-scale ground-mounted project in the UK must go through planning application and approval, and all completed sites stem from this initial process. Therefore, each site has one project developer, even though companies that often acquire shovel-ready sites are prone to overstate their role at the early development stages. One can only speculate that when other project developer rankings are shown on the internet, the researchers are not actually looking through at planning documentation or SPV ownership trail. Of course, the strategies of the greenfield developers differ widely. Some project developers are no more than land/site developers, looking to flip as soon as the site is approved. Others (albeit a relatively small number) do everything, from development to EPC work. The best example here from the list below is Vogt Solar, but there are other companies fitting this all-inclusive strategy (Anesco, British Solar Renewables, Lark Energy, Solarcentury and Push Energy). With the exception of Push Energy, all the other companies listed here typically have a flexible strategy of acquiring consented sites or simply acting as the EPC on the build process. Everyone else listed below in the top 20 graphic falls into a different category, with Lightsource probably unique in effectively managing the entire process from screening/public-consultation through to ownership and asset management, simply bringing in EPCs and component suppliers on arm’s-length relationships. No other company in the UK has been able to pull off the Lightsource model, and it is perhaps not a coincidence that Lightsource heads the rankings for both project-development and portfolio-ownership in UK solar today. Twelve of the top 20 companies shown below are pure-play developers with Hive Energy and Kronos Solar by far the most successful in the UK until now. 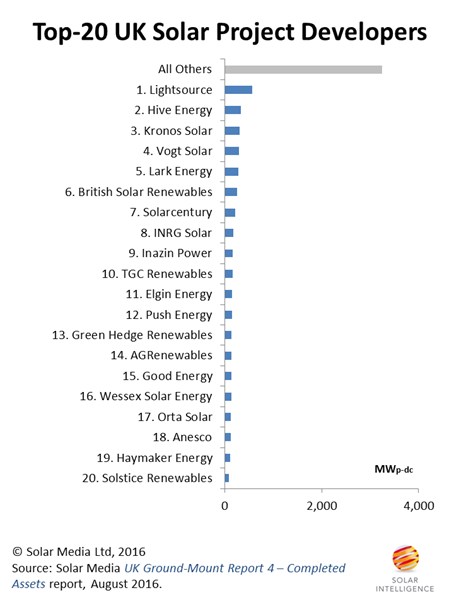 In fact, from a return-on-investment standpoint, these companies probably have been the main beneficiaries of the UK solar boom, with the well-defined exit-strategy of selling consented/shovel-ready sites offering significant profit margins in the past, and probably far more than any other part of the overall value-chain of a solar farm. Playing a game of percentages mostly, one successful site sale can easily compensate for several that were summarily rejected on application, with all upfront costs lost. And of these two mentioned above, Kronos Solar has likely been the most successful, with a planning appeal success rate that should send shivers down the spines of council officers that dared to reject a Kronos Solar planning application in the past few years; approximately one-quarter of the final capacity connected from Kronos Solar’s original planning application stemmed from applications where the company was successful during appeal proceedings following the initial decision on the planning application. While flagging the riches on offer to good pure-play project developers, it should be noted that being successful here is far from a walk in the park. There are plenty of examples in the UK where companies jumped onto the solar rollercoaster, tried to develop a bunch of sites, and simply got nowhere other than receiving planning rejections one after another. UK solar is in fact full companies that thought that doing ‘solar’ merely involved doing a bunch of remote screening opinions and then doing an electronic submission, and sitting back waiting for planning success and a healthy payday when the consented site was sold. Indeed, during 2013 and 2014, hundreds of megawatts of applications were submitted on this principle, with engagement with the public barely given a second thought. The Top 20 UK project developers account for approximately 55% of all ground-mount installed capacity in the UK today, with 18 of the companies UK-specific. Only two of the top 20 project developers come from outside the UK, characteristic of most markets where solar farm success is based upon having local knowledge of planning processes. This largely explains the absence of integrated companies based outside the UK, such as BayWa, SunEdison and Conergy, that typically saw strong business activity in the UK, but were in fact largely beneficiaries of the companies shown above or that populate the lower ranking tiers. Even behind the list of companies comprising the top 20 is a further subset of external consultants, agents and land developers that acted on behalf of the listed companies during early screening and land rights negotiations. And last by no means, there are the planners that are often relied upon to navigate the planning process, in addition to undertaking the paperwork audit trail needed for application validity or to discharge planning conditions before work can (officially) start. As we turn our attention now to the Republic of Ireland, it is interesting to note that only two of the top 20 project developers above are contributing to the 500 new solar farm sites included in our new Republic of Ireland Solar Market Entry report. This fact was recently discussed by my colleague Lauren Cook, in a blog featured on Solar Power Portal earlier in the week, noting also the strong activity of wind developers during the nascent phase of the Ireland solar market. But perhaps the biggest takeaway from the graphic above is the contribution from the ‘All Others’ category. More than 80 different project developers have been behind completed site capacities above 20MW in the UK, and almost 150 companies have more than 5MW built often comprising of just one site only. If the Republic of Ireland mirrors these trends, then visibility on project ownership now will be essential for many companies seeking to take advantage of sites taken through to completion. At the start of this blog, we flagged up the current environment for UK solar farms that is symptomatic of minimal new site screening or full planning applications. However, it would be extremely naïve to assume this situation is permanent, and there are glimmers of hope for UK solar developers since the Brexit referendum that the country’s long term fixation with Hinkley Point is not a fait accompli. It would only take a couple of political U-turns to put renewables back on the agenda in the UK, with solar vying for a leading voice in any revised long term energy strategy from the current or next government. Watch this space during 2017. If this was to happen, all eyes would surely be on the top 20 companies above, assuming of course they are still in business or have not decided yet that cash in the bank from 2011-2016 is a job well done, while having the appetite to restart again may simply not be worth the time and effort. One should not overlook local councils that now have sustainability departments, many of which have continued to screen new solar farm sites and put in full planning applications for 5MW farms during 2016. In the meantime, activity from project developers and planners will turn to the Republic of Ireland, as the countdown to policy announcements enters its final phase, and we wait and see which project developers there will end up being the leading contributors of solar farms five years from now, when the top 20 project developers list for Ireland will inevitably come to fruition.